Most nursing pillows provide a surface for you to place your baby on top of while breastfeeding, and then you have to hold your baby in place so you don't lose that precious latch! What's different about the Nesting Pillow is that the filling allows you to get your baby into the proper position, and then it conforms to baby's body and its weight helps it to stay put. 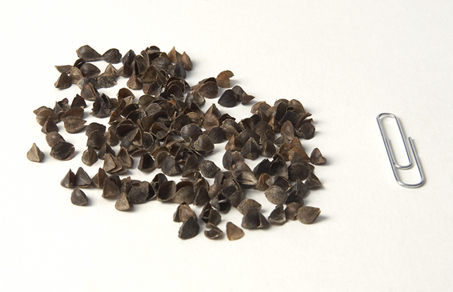 The miracle of buckwheat hulls is that they not only move around like a bean-bag, but they are shaped like little pyramids that interlock together like puzzle pieces so it gives stable support whatever size, shape or position you are in (and where you're sitting!). The Nesting Pillow is about 26” wide, 16” deep and 5” high, quarter moon-shaped. It weighs about 5 1/2 lb. The inside pillow is made of 100% organic cotton* canvas (from a US mill!) and can be spot cleaned and thrown in the dryer for about 15 minutes to keep it sanitized and free of dust mites. The slipcover is really easy to take off and get back on so you can wash it with your regular laundry as often as you need to. The insert is made of 100% organic cotton canvas, and filled with organic buckwheat hulls. The removable slipcover is made of 100% organic cotton French terry and Harmony Art Fabric's 7 ounce, 100% organic cotton twill print, Let It Grow in Blue & Brown. It is approximately 26” x 16” x 5” and weighs about 5 1/2 lb.